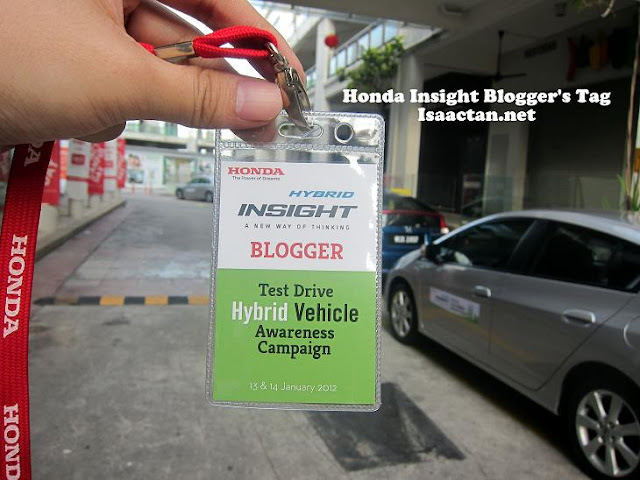 Just last week, I had the opportunity to test drive the hybrid car, Honda Insight over a 2D1N event which brought me from PJ to Port Dickson, then to Malacca and back, thanks to Honda Malaysia. It was a pretty good experience as this was the first time I'm driving a hybrid car. With everything going green nowadays, it's high time we explore the benefits and features of the cool new Honda Insight. Altogether 15 bloggers were called in to join Honda's "Test Drive Hybrid Vehicle Awareness Campaign", some of whom I knew, and some new found friends, all pretty awesome bloggers. The event kicked off with us gathering at The Bee, Jaya One early in the morning. After some breakfast, an ice breaking game, welcome notes by the management of Honda Malaysia, and a short briefing by our lead driver Harvinder Singh, we were all prepped up to go on our adventure. My team consisting of Kenwooi, and Mike Yip. Divided into teams of 3, we were ushered into 5 test drive Honda Insight cars, with each of us getting a chance to drive the Honda Insight over the course of our journey to Malacca. It was a exhilarating feeling as we got to go behind the wheel, competing against each other to win the Amazing Pace Game. It was rather simple really, just try to obtain the best fuel saving numbers at the end of each stop, and the lightest foot team wins. Unfortunately, our team were too excited, pressing the throttle a bit too much, and didn't get to win the game. Some key points from the Hybrid Vehicle Awareness Campaign is in order, starting with the basic question of what exactly is a hybrid vehicle. 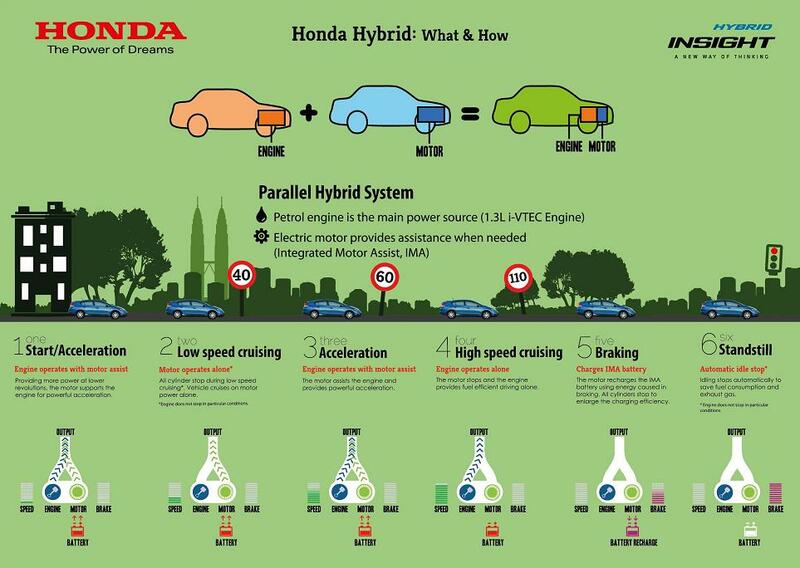 In a nutshell, Engine + Motor = Hybrid. Check out the infographic below which explains on "Hybrid: What and How". The Honda Hybrid utilizes a parallel hybrid system where the 1.3L i-VTEC engine is still the main power source, with the electric motor coming in as and when needed. 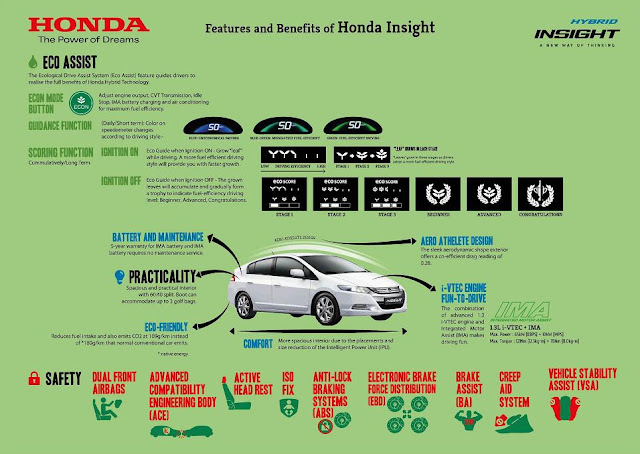 Some facts about Honda's hybrid car, the Honda Insight are outlined in the infographic below. What is so special about Honda Insight? 3 key points below helps to answer the question. 5-year IMA battery warranty - Honda insight is the only one that gives such a long warranty for battery. We continued the journey towards Malacca driving the Honda Insight like we owned it. Pressing the throttle lightly to get more fuel saving was cool at first, but after a while the novelty wore off, and I felt I needed a bit more power to the car. That was when I floored the pedal and accelerated hoping to get some much needed oomph from the hybrid car. Honda Insight works in such a way that at standstill and slow speeds, it utilizes the motor, while in high speeds and acceleration, the power from the engine finally kicks in, giving us some good acceleration power. Along the way to Malacca and back to PJ the next day, we stopped by some really nice hotels in Port Dickson for our meals, namely the Avillion and Thistle Hotel. We were truly pampered with food, which I will write on in separate detailed food posts, so do look out for it when it comes up. As for now, check out a couple of collages I made of the food we had over at Avillion Hotel Port Dickson, Thistle Hotel Port Dickson, and the Majestic Melaka. Now where did we retire for the night in Malacca? Well, we were really fortunate to get the opportunity to check in and stay over at the Philea Resort & Spa Melaka. Located just after passing the Malacca toll, Philea Resort was an excellent place to stay at, with wooden interior rooms, with an overall "back to nature feel" to the whole place. Check out the description I managed to get off their official website. Coming back to the Honda Insight, my personal take on it would be that it is a really cool car to have, one which uses modern hybrid technology to help us save fuel and in the long run, to save the world. 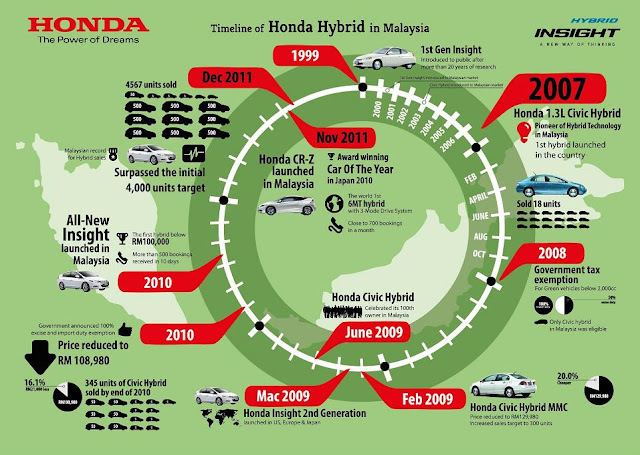 In fact the Honda Hybrid vehicles were around in Malaysia since 2007 with the introduction of the Honda Civic Hybrid, so the technology isn't exactly new. Check out the infographic below on the Timeline of Honda Hybrid in Malaysia. Selling at below RM100k, the Honda Insight is the first hybrid vehicle to sell in that price range. Honda Insight may not be what petrol heads are looking for, but for the general masses, the power and fuel saving features are adequate to keep everyone happy. The cockpit of Honda Insight itself has such a modern design that I felt I was driving a mini spaceship, with all the colorful displays and dials. Do check out a video done by Mike from Mikeyip.com as below which summarized up our whole journey that 2 days. Ya...buy one...and next time I go KL, you drive me around in it. Can? ;-) LOL!!! Awesome experience! So will you be getting the Honda Insight Hybrid anytime soon? cool one! Insight gonna have a new competitor coming soon next month!! Cool and exciting experience. Glad that you share on this as I was always wondering what 'Hybrid' is all about! Would like to take this opportunity to wish you and family a Happy & Prosperous Chinese New year 2012.
great experience..Gong Xi Fa Cai! It's cool to have been given the privilege to participate in such an awesome event. You got to test drive it too! You're lucky to be able to test drive such a nice little car. It got me thinking of getting one for myself.